Have you ever wondered about your ancestors? Who they were and where they lived? You have the opportunity to research these questions and find the answers as you participate in the 4-H Genealogy project. 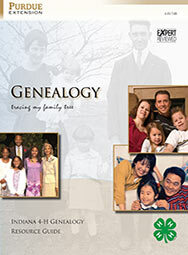 Genealogy, the tracing of your family history, can be a fascinating project. This manual will help you start on a never-ending journey that you will enjoy even after your 4-H career ends.